Since their discovery in 2006, deep learning and deep belief algorithms have underpinned many of the most powerful tools for pattern recognition and machine learning. My open source project "Vulpes" combines the functional elegance of F# with the massively parallel capabilities of general purpose GPU programming, and runs a deep belief net on a variety of popular test sets. My talk explains the core of Hinton's breakthrough in 2006, and shows how Vulpes uses QuantAlea's CUDA monad as a robust, strongly typed bridge between the host (the CPU) and the device (the GPU). Rob Lyndon is a software developer and actor. He holds a PhD in applied mathematics from the University of Leeds and an MA in classical acting from the Royal Central School of Speech and Drama. 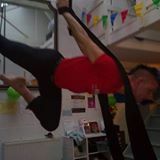 His primary interests are machine learning, functional programming and aerial circus arts.